The gold frenzy in the first half of the 19th century forever marked the history of the United States in ways that very few events have been able to. People inundated the west coast pursuing the different claims of gold, some were true, and some were false, but all who followed them changed the west in their wake. Such affluence of people needed to resupply somewhere, and so new settlements started to pop out all over the place. The ones already there began to transform into boomtowns, some of them in less than a year. Such is the history of Jacksonville. Its name comes from the Jackson Creek, which runs through the community. It has situated the Jackson County, Oregon, United States, about 5 miles west of Medford. It was one of the many small settlements present in the area, but that was about to change. Gold nuggets were discovered in Jackson Creek in 1851, but that was just the beginning, more gold deposits were found later. In only a year, Jacksonville became one of the most famous and prosperous boomtowns as people flooded in looking to get their hands on all that gold. Accurate numbers are impossible to come by, but it is estimated that thousands of people settled in the area. By the winter of 1852 Jacksonville, then known as Table Rock city, was buzzing with saloons, gambling halls, shops and even a bank. However, not everything was as prosperous as it seemed. Life was quite harsh in the Oregon Wild West, and even more for those looking for gold. The epidemic of smallpox in 1868, the flood of 1869 and regular fires in the town made life in Jacksonville even more challenging. However, Jacksonville greatest enemy was hunger. Many people do not know this, but Jacksonville regularly suffered from food shortages. There were no reliable sources of food nearby; the majority had to be shipped by boat to San Francisco and from there by stagecoach to Table Rock. This community rich with gold still had difficulty with food. Jacksonville prosperity went on for decades, so much in fact that it was named the county seat. It had become the commercial and cultural center of Southern Oregon. However, all good things must eventually come to an end. When the gold deposits were depleted, and the railway bypassed Jacksonville in 1884, the city's economy slowed, and a slow economy drives people away. They abandoned the area to focus on other more lucrative businesses. Jacksonville began to transform back into the quiet place it used to be. It is important to take into account all the consequences of the gold rush, both good and bad, and one of them was the displacement of native Americans. The area used to be populated by the Upland Takelmas native American tribe. Sporadic contact with tribe had existed before, but nothing could prepare the tribe for what was about to come. The influx of white settlers caused friction till the situation became unsustainable. The native populations did not have the strength to face them, and as such, they were removed from the area. A considerable number of Chinese people traveled to Jacksonville during the gold rush. The majority came from San Francisco, California. The place where they settled in Jacksonville became the “first Chinatown” in Oregon. This is known thanks to the discoveries made early in March 2004 when road work uncovered several relics that dated back to the 1850s and 1860s. Among the findings were broken Chinese bowls and teacups, handmade bottles, fragments of opium paraphernalia and Chinese coins. Jacksonville is a living monument to the past. Most of the city is now a National Historic Landmark due to the preservation of so many of the old buildings, thanks in no small part to the Bureau of Land Management and the efforts of its citizens. The Bureau of Land Management signed an agreement with the City of Jacksonville in 1991. This treaty guaranteed that the areas would remain in protective public ownership thanks to their historical value. The town itself is a lovely little place to visit. Although it may not be booming in the same way that it was during the gold rush, there is still a vibrant community here. The mining heyday may be long over, but there is still gold in the mountains around Jacksonville. Jackson Creek was the place where gold was first discovered and there is still plenty of it left. While the old-timers mined the area hard, a diligent prospector can still find a little color here. Other rich creeks near Jacksonville include Walker Creek and Poorman Creek. Just over the ridge to the west is Forest Creek, a tributary to the Applegate River(one of Oregon's richest gold rivers). Many miles of Forest Creek were dredged and the tailing piles are still visible. To the south, Sterling Creek is another tributary to the Applegate River. 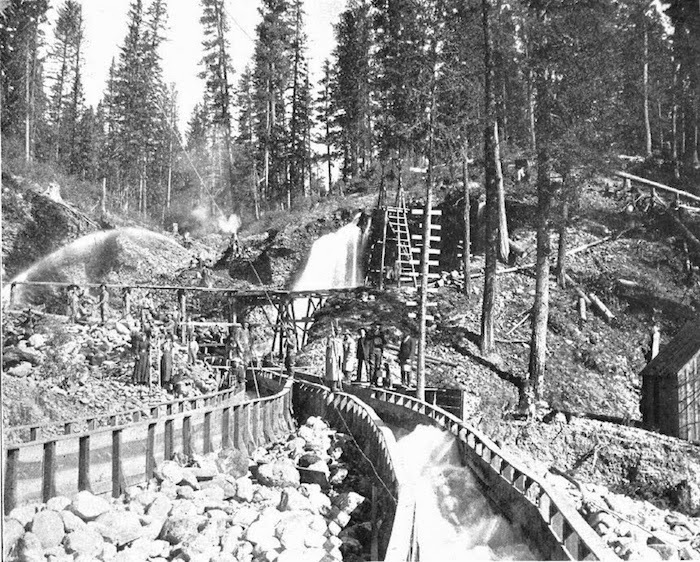 It was another particularly rich drainage that produced considerable amounts of gold for miners. Prospectors today can use a basic gold pan and still recover some gold from these waters and others in Southern Oregon. Carefully removing material off of bedrock and panning it out will generally result in some good "color" if you take your time and find the right spot. I also know several people who detect for gold nuggets in tailing piles like those mentioned above. Southern Oregon has produced some very large gold nuggets over the years, and nowadays a metal detector is one of the best ways to find them.